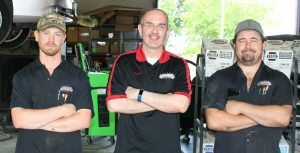 (WACO) — In the fast lane it can be easy to forget the importance of family values, but for the folks at Wisener’s Auto Clinic, LLC, family is what keeps the engine running smoothly. For over 30 years, Wisner’s has prided itself on serving the Bell County area with honest and efficient work, entrusting two TSTC graduates to help preserve that mission. “We need to look at our business with a servant’s heart and provide the highest level of service to our community and others,” Neil Wisener, president, said. Justin Dillard and Chris Duffy are both TSTC alumni working at Wisener’s. Dillard graduated in 2013 with an Associate of Applied Science degree in Automotive Technology and Duffy graduated in 2002 with a certification in Industrial Maintenance. Dillard has been with the company for a year while Duffy has been with the company for the past two and a half years. “It’s been great with Wisener’s because it’s family-based. I worked with Bill, Neil’s dad, and Neil, and they really do want you to be your best and keep training to be better,” Duffy said. After graduating, Dillard felt confident to enter the workforce and credits his time at TSTC for helping him to succeed. “I like working on cars because it’s always something different and TSTC really prepared me for the industry and interviews so that I can do what I love,” Dillard said. During the hiring process at Wisener’s, Neil asks applicants what their goals are to determine if they are dedicated to providing the level of service his company is known for. Both alumni agree that their time at TSTC and Wisener’s is allowing them to grow in their careers, while still having time for family. “I got started working on cars with my dad and my brothers went to TSTC for industrial maintenance too. Family is important to me just like it is to the Wisener’s,” Duffy said. Wisener’s Auto Clinic, LLC was purchased by Bill Wisener, Jr. in 1987. Neil Wisener purchased it after his father retired in 2009. There are two locations in Temple. With TSTC as a partner, the future is bright for the established auto shop and the graduates hired to work there. This entry was posted in Waco on July 5, 2018 by Daniel Perry.